We're ready for our close-up, Mr. DeMille. With the Best of the Twin Cities issue on newsstands, it's finally time to celebrate with a good old-fashioned Hollywood soiree. We've got the nosh, the drinks, the music, and the fun -- you've just got to get glam. As an extra incentive to put on the ritz, we're having a contest for everyone who dresses up. Minneapolis fashion retailer Len Druskin will be sending a secret fashion spotter to our party, and will pick the 10 best looks of the evening. Each winner will be featured on our site, and will receive a $100 gift card. So start planning your outfits now. See also: Best of the Twin Cities 2014 party: Get your tickets! No need to go Norma Desmond on us and do a complete makeover (though we will admit that Gloria Swanson's Sunset Boulevard looks are all absolutely fabulous). You can get that old Hollywood look with just a few simple steps. Here are some of our favorite looks from Hollywood's Golden Age, when Veronica Lake and Grace Kelly were queens of the silver screen and Cary Grant and Humphrey Bogart made every scene suave as can be. Norma's ready for her close up. Are you? Gowns, dah-ling. Strapless, sleeved, whatever -- floor-length dresses are always at home on the red carpet. Marilyn Monroe might've made a splash with her pink wiggle dress for "Diamonds Are a Girl's Best Friend," but Rita Hayworth beat her to the punch in this showstopper from Gilda in 1946. Speaking of diamonds... they're forever. (Also, pearls.) So throw on some costume jewelry to complete your glitzy look. Take it from Fred Astaire: The man could do it all, from looking great in a tux to tapping and singing his way around a rain storm. Here, he's got the perfect old Hollywood look: dapper formal wear and a top hat (you can never be too over the top). If you don't want to bust out a tux, a well-tailored suit will do the trick with some pomade-slicked hair parted on the side. Or, just go Rebel Without a Cause. It's easy, classic, and who's cooler than James Dean? Keep it simple, sophisticated, and sleek. See those well-defined brows on Lauren Bacall? Look no further for your makeup inspiration for the evening. Don't bother with too much eyeshadow. 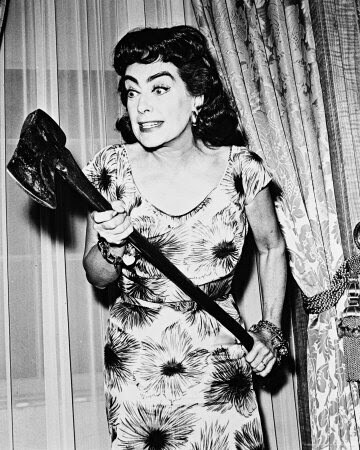 Instead, use your energy on some nicely sculpted brows (don't go too Joan Crawford, though), a thin stripe of eyeliner, and a few coats of mascara to open up your eyes a little more. Plus, simple eye makeup means you can go bold with your lips -- try a vampy red or a pretty pink -- just remember to line 'em otherwise you might end up looking like the Joker. Deep side parts, no matter how long your hair is, are the way to go. From a cute Audrey pixie cut a la Roman Holiday to luscious peek-a-boo waves like Veronica Lake, you'll want to make sure you've got sweep down pat for that 40s and 50s old Hollywood vibe. To get those luscious locks, just divide your hair into two sections, top and bottom. Curl the bottom half with a one-inch curling iron (or better yet, hot rollers) in the same direction and secure with hairspray. Next, let the top half of your hair down and repeat. Make sure all the curls are going the same direction, since that's where the gorgeous wave comes from. Spray and wait for a few minutes to let your curls cool. Then, brush 'em out from root to tip to create the smooth wave. Set with spray, and you've got yourself some peek-a-boo action. Don't have the goods in your closet to complete the look? Pay a visit to our pick for the Best Vintage Clothing Store in the Twin Cities.